The "What You Say in Here, Stays in Here" Confidentiality Banner is my absolute favorite. 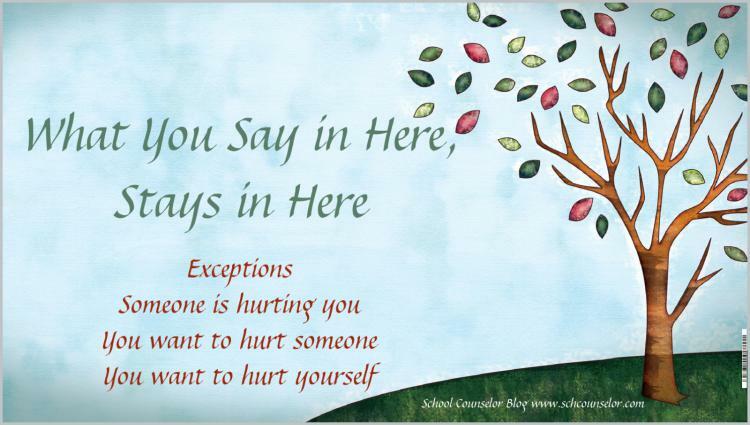 This banner provides a great way to address confidentiality and have a constant reminder to students that they are in a safe place. Check out this banner in my office here and here. Colorful chevron version of my popular "What you say in here, stays in here" banner. I created this banner to compliment the college pennant display in the student services suite at my school. Believe in Yourself Banner with highlighted BE YOU message. My intern, Courtney, designed this banner for me as a gift! You can see it hanging in my office here. I absolutely loved the message and I love hands! :) I had requests to share this design with you, so here it is! I use my "group rules" banner for more than just groups. The rules on this banner are really rules for my office all of the time. I love having them displayed so that students can refer to them. They also like to "remind" each other of the rules ;). Check out the "group rules" banner in my office here and here. I love the book "Oh, the Places You'll Go!" by Dr. Suess. It is a great book to read to get students thinking about what they want to do after high school. It can also be read at graduations and transitions from elementary to middle school or middle school to high school. I made this banner to hang in my office as a reminder to students that they can go anywhere if they put their mind to it!